Katie Prices latest single Free to Love Again flopped in the charts yesterday, failing to reach the top 40, and coming in a sorry number 60 on the top music list. Despite cutting short her honeymoon to promote her single on GMTV, the record sold a measly 3,000 copies, with radio stations deeming the track not credible enough to play. And it seems the sad sales figures have put Katie – whos already admitted she cant sing or dance  off a trying to launch a full-time music career. ‘There are no plans for her to do another single at the moment,’ an official told the Mirror, yesterday, amid rumours music was a last ditch attempt by Katie to restart her failing career. And if her lack of single success wasnt bad enough, Miss Price landed herself in hot water for other reasons yesterday, turning up late for a charity polo match, and forcing her team to scrabble around for a last minute replacement. 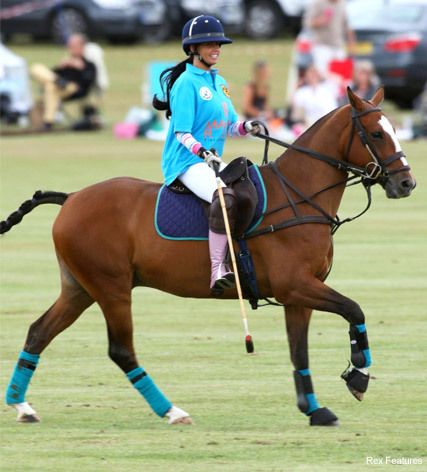 Despite trying her best to gain access to Prince Harry, who was also at the match, Jordan was kept firmly out of the VIP area, reportedly leaving polo buffs wondering about her talent. ‘She looked like shed never been on a horse before, never mind played polo,’ said one insider. What are your thoughts on Katie Prices single? Should this be the beginning and end of Miss Prices music career? Let us know in the comments box below.